Everett miniature lamp base - 3" (76 mm) high. Despite its size this is a perfectly formed lamp base - it even has a hole for the flex. 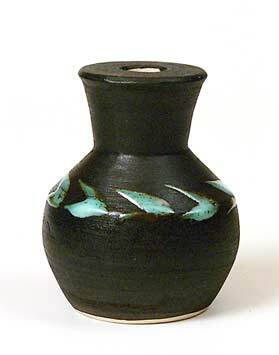 When Ray Everett left Rye Pottery in 1960, he started Raymond Everett Pottery, working from a shed in his back garden. He soon realized that the lack of comfort, space and amenities would not allow him to make a sufficient number of pots to earn a living. In 1960 he moved into a basement in Conduit Hill, Rye, and was soon making new kilns and other improvements to help him keep up with the demand that resulted from the prominent position of his new premises. By 1966, when the pottery closed, he was working to full capacity and making more pots for export than for the home market. In that year he was offered a position as a tutor in ceramics at a new college in Crawley. He accepted the post and handed over his premises to his old colleague from Rye Pottery, Dennis Townsend. After the move to Crawley he continued to pot at home, and after his retirement from teaching in 1980 he set up The Ray Everett Craft Pottery.